Locals and police maintained that the fire seemed to have broken out on the ground floor before spreading to the other floor. 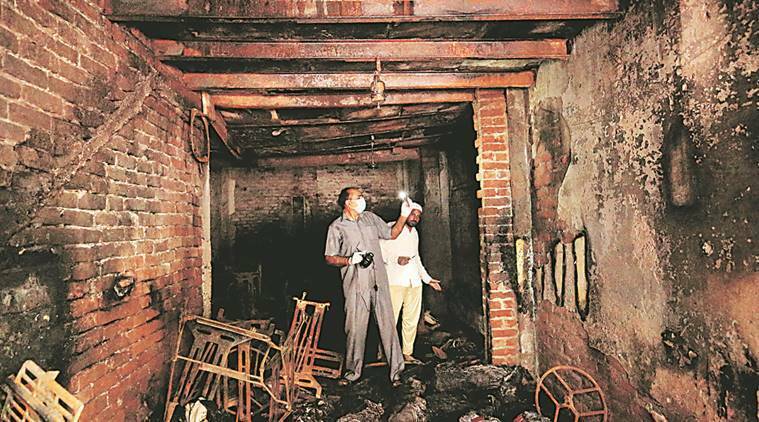 Thirteen employees of an illegal garment factory suffocated and burnt to death after a fire broke out in Ghaziabad’s Shaheed Nagar area early Friday morning. Three others sustained injuries in the incident and are undergoing treatment at Guru Teg Bahadur (GTB) Hospital in the capital, said police. According to the police, the incident took place around 5 am on Friday at a jacket manufacturing unit operating from a three-storey building located in Sahibabad. “Initial investigation revealed that the fire broke out due to an electric short circuit. There have been 13 casualties and three people are being treated at GTB Hospital. The situation is under control. The fire department is conducting an investigation into the incident and more facts will be revealed soon. The place had been taken on rent and winter jackets were being manufactured there. The rexine and foam used in jackets would have caught fire easily and generate a lot of smoke,” said Salmantaj Patil, SP City, Ghaziabad. Fire tenders found it difficult to douse the flames as the factory is located in a narrow alley, said police. “The fire tenders had reached the area at 5.20 am but it took them a while to reach the spot because of the narrow lanes. It is a densely-populated area and the lanes have also been encroached upon. Even today morning, vehicles had been parked on both sides of the street,” said Nidhi Kesarwani, Ghaziabad district magistrate. Police said an FIR has been registered against two persons — Rizwan and Nazakat — who had taken the building on rent. “An FIR under Section 304A of the IPC — causing death by negligence — has been registered. Both persons have been arrested. They had been operating the unit for nearly two years,” said Anup Singh, CO Sahibabad. Later on Friday, the Uttar Pradesh government announced a compensation of Rs 2 lakh to each deceased’s family.